Located at the southern tip of Africa, South Africa is one of the most diverse countries on the continent. In fact, there are eleven official languages in South Africa. As one of the wealthiest countries in Africa, it boasts some of Africa’s most prestigious post-secondary institutions, and contains some of the most spectacular wildlife reserves in the world. This makes it a desired destination for many Canadians beyond tourism. If you are Canadian or have ever been issued Canadian documents that need to be used in South Africa, you will have to go through a process to make your documents valid for use there. These include documents such as affidavit, power of attorney, Canadian passport, birth certificate, or marriage certificate for use in South Africa. South Africa uses the apostille process, the most widely used process for validating documents issued in foreign countries. Since Canada has not signed the Hague apostille convention, Canada does not use the apostille process. This is not common knowledge and as such can be very confusing if you have been told to get a Canadian apostille. Canada uses the original two step process of authentication and legalization. This process is equivalent or equal to an apostille and is recognized as so in South Africa. Therefore, if you have any Canadian documents that need to be used in South Africa you will need to have them authenticated and legalized. Authentication and legalization involves validating signatures on a document. First, Global Affairs Canada checks to see if a Canadian document contains a signature that they have on file. The signatures they have on file are all from individuals who are certified to claim whether or not a document is real or a true copy and includes lawyers, notary publics, and even select government staff such as the head of the RCMP and signatories from the various provincial vital statistics departments. If the document has one of these recognized stamps, seals, and signatures, and also meets their requirements, then Global Affairs Canada place their authentication stamp on the document. However, there is a catch. It can take more than 20 business days for Global Affairs Canada to authenticate documents they have received. Once your Canadian documents have been authenticated they are ready to be presented to the embassy for the second step of legalization. Since it would be impractical to have the signatures of every lawyer, notary public, and certified government officials on file at every foreign embassy in Canada, most embassies only recognize the authentication stamp, seal, and signatures from agents at Global Affairs Canada. The staff at the consular section of the embassy, in this case the South African High Commission here in Ottawa, check to see if the document has been properly authenticated by Global Affairs Canada. Prior to placing their own stamp, seal, and signature on the document, they have various requirements and fees which need to be provided along with the authenticated documents for the embassy to legalize them. These can change quite frequently which often makes legalization the most difficult step of the process. Along with the South African High Commission’s own changing processing times, preparing your Canadian documents for use in South Africa can take over a month. This is assuming you do it properly on the first attempt which is seldom the case even if you’re familiar with authentication and legalization. Realizing how difficult and stressful this process was for Canadians, we saw there was a need to provide a service to Canadians that did not exist. Over 25 years ago we became the first company to provide authentication and legalization; it’s why it’s in our name. Since then we have helped thousands of Canadians with their affairs in South Africa and over one hundred other countries. Our dedication to providing the highest quality service is recognized not only by Global Affairs Canada but also the embassies in Ottawa and dozens more across Canada. Indeed, the relationships we have built with their staff allow us to be up to date on every changing requirement and fee. Although we have no influence over processing times of foreign embassies, we can save as much as 20 business days off of authentication by presenting your documents on your behalf to Global Affairs Canada the same day they arrive in our office. This is our priority same business day authentication service, one of our three service speeds. Our 3 business day authentication and 10 business day authentication services combine affordability with speed to ensure your document needs are met. As our client you have your own agent to assist you in preparing your documents prior to processing. Once the process has begun, your only job is to sit back and relax while our experts take care of the rest. You will receive detailed updates at every stage and have an agent readily available to personally answer any questions or address any concern at any time during our business hours. 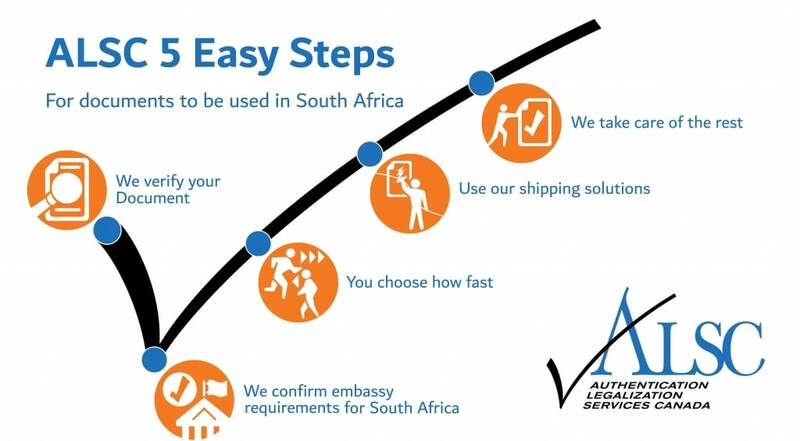 Our service guarantee ensures your documents will be valid for use in South Africa. Once your documents have been completed we can send them anywhere in the world they need to go via one of our many trusted shipping partners. If you have Canadian documents for use in South Africa, contact us to save time, delays, and money in the long run. Below you can find additional information about some Canadian documents you may need to use in South Africa. There are many Canadian documents that may need to use in South Africa. These include power of attorney, affidavit, passport copies, birth certificates, marriage certificates, and death certificates. These are commonly requested for purposes relating to a sale of property in South Africa, for citizenship, employment, marriage, or estate related matters. For Canadian powers of attorney for use in South Africa they will first have to be notarized by a lawyer or notary public to be valid for authentication at Global Affairs Canada. You may already have your power of attorney ready to go, in which case ensure that the stamp, seal, and signatures are all visible and also match. If you do not have your power of attorney for use in South Africa, you can either have a lawyer draft one for you at which point they will also notarize it, or alternatively you can draft your own and present it to a lawyer or notary public for notarization. Depending on your purposes it is recommended that you do this with a lawyer and they can provide legal advice whereas notary publics cannot. The same is true if you have a Canadian affidavit that needs to be used in South Africa; it will also requite notarization in order to be authenticated at Global Affairs, and can likewise be drafted for you by a lawyer if you do not already have your Canadian affidavit. If you have a Canadian passport that needs to be authenticated and legalized for use in South Africa, you will have to have a notarized copy made as Global Affairs Canada cannot authenticate the original. This is in part due to it’s small size but primarily because it does not contain any signatures which Global Affairs Canada can authenticate. If you need to do this, note that you only need to have a notarized copy of the photo ID page unless a full notarized copy has been requested by your affiliates in South Africa. Some of our clients forget this and spend an unnecessary amount of money to have a notarized copy made of their entire passport. If you use our services, we can make a notarized copy of your passport for you. It is best that you make the notarized copy of your passport yourself but we are happy to assist you if there are circumstances where this is not possible. Canadian birth certificates, marriage certificates, and death certificates may be requested of you in South Africa for affairs related to immigration, employment, marriage, or inheritance. Although these are some of the most important documents which you can be issued in your lifetime, they are rarely used within Canada which makes them prone to loss or damage over time. The good news is it is quite easy to get a new Canadian birth certificate, marriage certificate, and death certificate. Unlike many other Canadian documents, Canadian vital statistics documents do not require any additional processes such as notarization to be valid for authentication at Global Affairs Canada as they have their signatures on file. In fact, it may be less expensive to order a new vital statistics document than to make a notarized copy. It is a good idea to use original documents wherever possible as they are always preferred for authentication and legalization. This makes Canadian birth certificates, marriage certificates, and death certificates some of the easiest documents to process for use in South Africa and just about any other foreign country. Keep in mind that you must order your marriage certificate and death certificate from the provincial vital statistics office of the province in which the life event occurred. Marriage certificates issued by the church and death certificates issued by the funeral home cannot be authenticated by Global Affairs Canada even if a lawyer or notary public has notarized them. Finally, when ordering your new Canadian birth certificate, marriage certificate, or death certificate, remember that long form versions specifically of birth certificates are the only ones which can be authenticated by Global Affairs Canada. Wallet sized vital statistics documents such as birth certificates cannot be authenticated. These long form versions go by different names depending on the province, but include copy of an act of birth and registration of life birth. Many of our clients also choose to have their documents sent directly to our office to save themselves time. This is highly recommended especially if you currently reside out of Canada. There is a chance we can complete the authentication and legalization process before they would arrive to you elsewhere unprocessed! Nelson Mandela once said “it always seems impossible until it’s done”. This cannot be more true when it comes to the process of authentication and legalization. Every year dozens of our clients come to us for assistance after having tried and failed to process their Canadian documents for use in South Africa. Every time we leave them satisfied, stress free, and ready to address their affairs in South Africa. We know it can be difficult to trust a third party with your sensitive documents. Our multiple 5-star reviews on Google and Facebook, A+ rating with the BBB and esteemed membership with the Canadian Chamber of Commerce are proof that we are not only trustworthy and reliable but efficient and professional. In fact, we are always looking for ways to make this process easier and more convenient for our clients. This is why we have opened over a dozen service centers across Canada with plans to open many more. These service centers allow you to avoid waiting in line at the post office and eliminate any shipping costs. When you use our service centers your documents receive free shipping by FedEx to our headquarters in Ottawa for processing. Make sure you contact us before going as we need to make an appointment for you. A failure to do so means we may not be able to accept your documents. Upon completion we can send your documents to any one of our service centers across Canada or elsewhere in the world at an additional cost. Our service centers are convenient if you live in or near Calgary, Edmonton, Victoria, Winnipeg, Toronto, North York, Mississauga, Halifax, Vancouver, Surrey, Regina, or Montreal. No matter what your Canadian documents, no matter what your purposes, we are here to help you with your affairs in South Africa. Click below to get started with the most professional team in our industry.